"Best Hot Air Brushes". When styling your hair there are many different tactics you can employ, as well as countless pieces of equipment which can help you achieve that perfect style. Whether you want it straight, curly, wavy, or something in-between, you need to identify the equipment and products that are going to work best for you, and then learn how to use them as well as possible. A hot air brush is a fantastic way to style your hair and go, without having to straighten or curl, which can take considerably longer. Many people also use a hot air brush to cut down on the amount of actual blow drying they need to do, allowing hair to dry naturally for the most part, and then styling and drying at the same time. First things first however, what exactly is a hot air brush? Let’s explore this in a bit more detail, and learn how to use this piece of equipment. ​Babyliss is a big named brand, and for many people that means peace of mind. 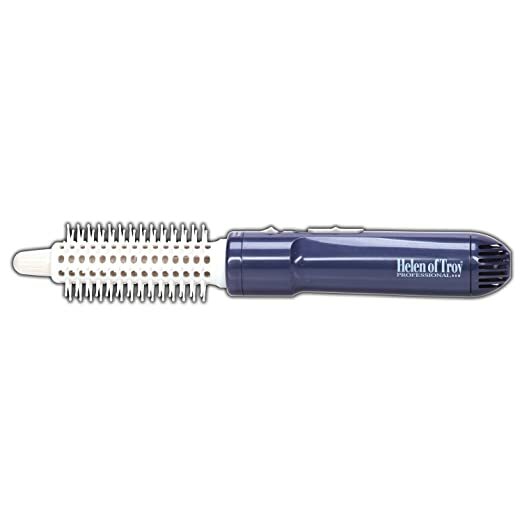 This is a very attractive hot air brush, in a baby blue colour, and is small enough to put in your bag and take away with you if you need to. This is a very low cost product, which is ideal for those on a budget. The brush is also rotating, which is great for the price. ​This is a very stylish hot air brush, and because of that you can expect to pay a little more towards the higher end of the scale. Having said that, the reviews more than make up for that downside, as they are constantly positive. ​This particular hot air brush is a very attractive option, and one which you can easily take with you. The price is a little high, but it is quite comparable to other brushes of the same level of quality, and reviews are consistently high also. This rather interestingly named hot air brush product is a very high standard option and a low priced one too, which is always a bonus! A hot air brush is literally what the name suggests, it is a brush that can be heated up, either via a cord or rechargeable means, and it is therefore used to style your hair and lock in style at the same time. A hot air brush is also a good way to not only style your hair, but dry it at the same time. For that reason, always use the brush on your hair when it is ¾ dry, to finish it off in this way. You are using direct heat on your hair, and whilst you’re not using it in the same way as you would with a curling wand or a pair of hair straighteners, you are still applying a certain amount of heat directly to the hair shaft and you need to look after your hair properly. For that reason you still need to use heat protection, and that could be a spray, or a lotion. Remember to ensure you get from root to tip, but don’t use too much otherwise you will end up with a greasy appearance to your hair. You need to warm up your brush so that it is going to be ready to use; too cold and it’s not going to style, too hot and you could damage your brush. This step will also save you time when styling on the go. If you have opted for a brush which has ‘steps’ in temperature, e.g. you can go up or down in increments, it’s a good idea to heat it up to the maximum heat you want to use it to first, and then drop it down a few increments if you need to. To get the best results, you should section your hair off and style each piece in turn. Try and keep your sections a little thick, because if you apply heat to thin strands, you’re more likely to cause damage. Check out this video for a little help on how to section your hair correctly, to give you the best results. Using a hot air brush is not simply about brushing, it’s about applying a certain amount of technique to each strand. Working with each section, begin at the root and work to the tip, working slowly and carefully. This will give you more volume for your hair style. To get the best results, ensure your hair is ¾ day. If you want to add a curl, slowly brush your hair from the root, rolling your hair around it and then turning back to the root – hold the brush in place for a few seconds, and then release. If you attack your hair straightaway and don’t allow it to cool, your style will not lock in place. If you need to go back over any section of your hair, don’t go near it until 5 seconds after you last brushed it, as this will eliminate the chance of damage to your hair. If you need a visual pointer, check out this video on how to use a hot air brush properly. If you want to create curls, this video will show you how. There are certain areas you need to pay attention to when you are looking to invest in your new piece of hair styling equipment. Features – Does the brush rotate? Does it have ionic technology? There are several features that a good quality hot air brush should have, so always check into this a little deeper before making a purchase decision. Heat settings – Some of the cheaper hot air brushes literally switch on and off, therefore just one heat setting, but some of the better ones have several heat settings, which allows you to tailor your brushing experience to your hair; if you have thicker hair, you can go hotter, if you have thinner hair, you need to keep the heat lower. Brand – Obviously it’s not all about the brand name, but there’s no denying that some brand names are more reliable than others, and you get a lot of peace of mind in your purchase also. Price – You need to find something which suits your budget, so shopping around is going to find you the best deals here. Reviews – Always check out testimonials, to help you make your decision. This will highlight any failings that the brush has, when they probably aren’t going to be highlighted on the product spec provided by the company! Obviously everyone is different, and that also means everyone has different hair types. It’s important to identify your particular hair type before you decide on a hot air brush to purchase, because if you go for one which is too hot, you’re going to damage thin hair, and if you go for one which doesn’t have the highest of heat settings, you’re not going to be able to create curls, and you’re not going to do a lot for thicker hair either. This is where reviews always come in handy, and shopping around will help you find the lower prices to make your purchase a little easier on the pocket, but higher in the quality stakes. Let’s check out some of the best hot air brushes on the market, and pit them against each other to find a winner. These five choices are certainly some of the best hot air brushes on the market, whilst there are other choices out there too, these constantly receive high reviews and are always at the top of the must-have list. 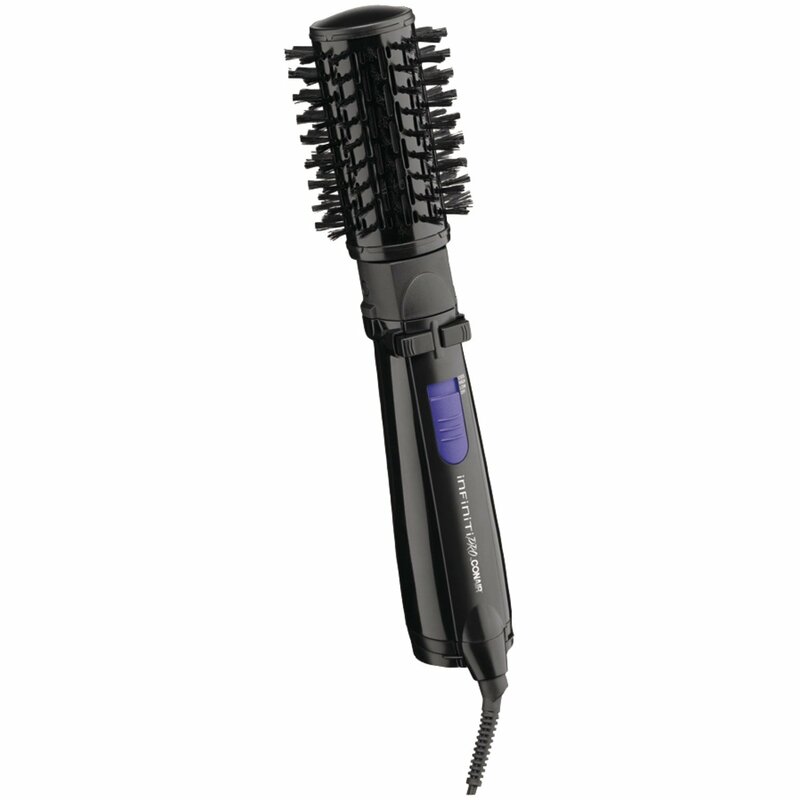 In terms of the winner, the BaByliss PRO Nano Titanium Rotating Hot Air Brush is a great choice. This particular hot air brush has the most features, including that all important safety feature – automatic shut off. None of the other brushes on our list has this feature, which is really what sets it apart. Whilst the price isn’t the highest, you do get what you pay for. For those on a budget, the Infiniti Pro by Conair Spin Air Rotating Styler is a clear choice to go for. This has options which the price shouldn’t really have, and that is a fantastic added bonus for those who don’t want to splash the cash on a product such as this. 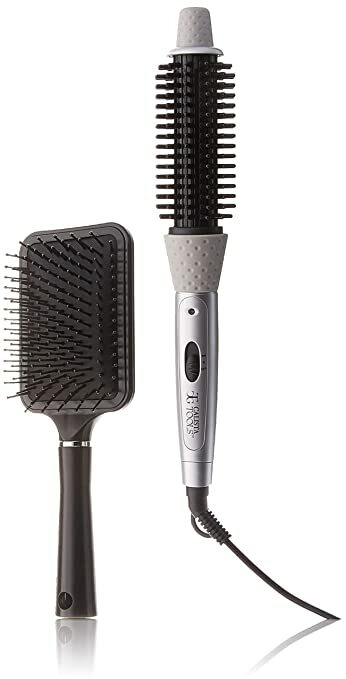 This brush also comes in three different size options, which means any hair length or type can use this brush with ease. ​​We hope you enjoyed the article! If you have any more reviews on the best hot air brushes, then do comment down below. We would love to hear what you have to think.